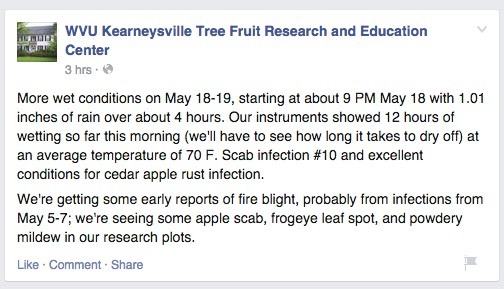 19-May, 2015 (Tuesday) Fruit Twilight Meeting, Clarkdale Fruit Farms, 303 Upper Rd., Deerfield, MA. 5:30 PM. Light dinner will be served. 1 pesticide re-certification credit. $20 meeting fee. 20-May, 2015 (Wednesday) Fruit Twilight Meeting, Tougas Family Farm, 234 Ball St., Northboro, MA. 5:30 PM.Light dinner will be served. 1 pesticide re-certification credit. $20 meeting fee. McIntosh petal fall is 110%. 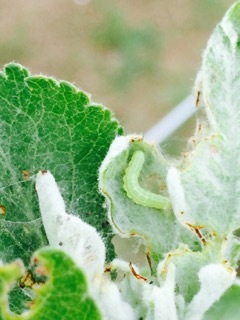 Time for petal fall insecticide (plum curculio, green fruitworm, Oriental fruit moth, codling moth, other misc. riff-raff) and chemical thinner (carbaryl, Fruitone-L, Amid-Thin). Watch for fire blight conditions on late blooming varieties, although right now the risk looks pretty minimal (after today maybe) because of cooler weather. 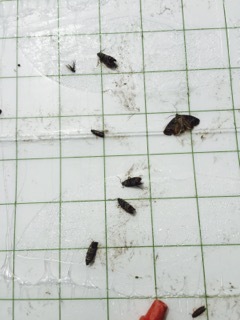 First trap catch of codling moth was earlier this week, so that starts the DD Base 50 model of 250 DD's for treatment. NEWA has excellent tools for apple scab, fire blight, Oriental fruit moth, plum curculio, codling moth, etc. Please use them with the weather station closest to you! Let me know if any questions. Hope to see you at the fruit twilight meetings Tuesday and Wednesday this week (May 19 and 20). They should be good! Fruit thinning will be a major topic of discussion. See The way I see it and Scaffolds Fruit Journal, May 18, 2015 'Don't Blink - New York Minute' for Art Agnello's discussion of petal fall insect pests and treatment options. With the rain this morning, May 19, and more predicted this afternoon, we are definitey having an infection period. The only debate concerns how serious it is. That’s because one model says we are at the end of primary scab season, another that we are still stuck at the beginning, and two others that we are somewhere in the middle. Fortunately we also have been looking at ascospore maturity more directly. Basically they indicate to me that there are plenty of spores around, and that this is a major infection period. The details are below. Based on the intensity of this infection, we recommend using an application of an effective post-infection fungicide plus an EBDC protectant even if you were protected going into the rain. There are several options for post-infection fungicides. Consult the New England Tree Fruit Management Guide, Chapter 6, Disease Management for a table listing “after-infection activity”. Select a fungicide with at least 48 hr after-infection activity to mix with mancozeb or another EBDC. The 48 hour window is measured from the beginning of the wetting period. If rain began during the early morning on May 19, the 48 hour window would run out in the early morning of May 21. With drying on Wednesday May 20, there will be several hours to make an effective application. 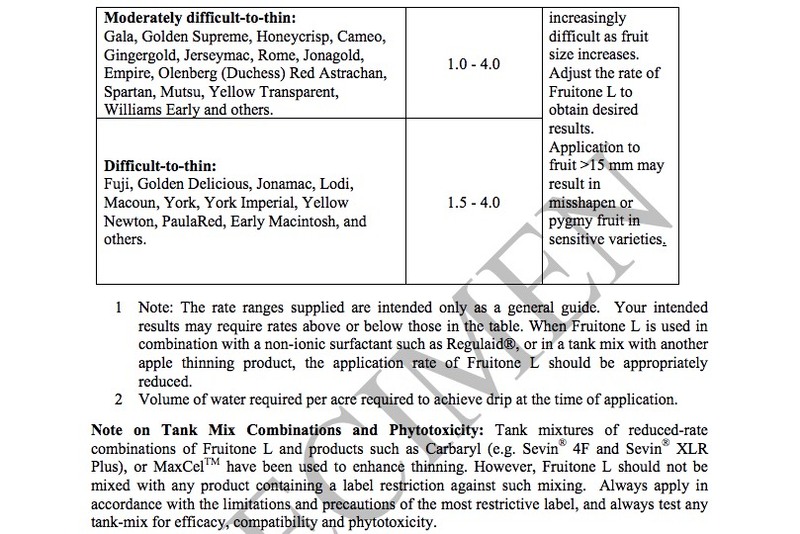 The inclusion of a fungicide that is effective against powdery mildew is also recommended. Fortunately, the fungicides with good post-infection activity (DMIs, QoIs and SDHIs) are also effective against powdery mildew. 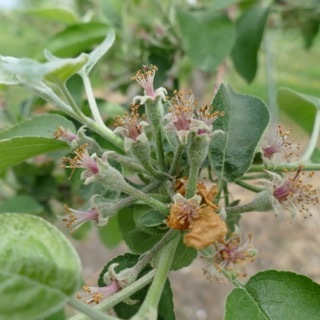 Where there are still trees in bloom, the risk of blossom blight remains very high. 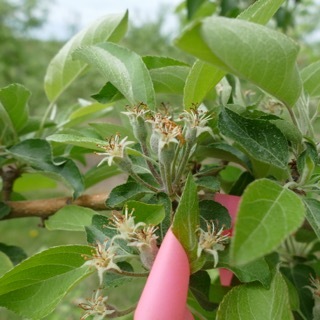 Those growers with flowers that had not been sprayed with streptomycin going into the rain should treat those trees as soon as possible when rain stops. This week we will show how our observations of ascospore maturity have changed over the past few weeks. The number of spores we have trapped in our spore release tests are all going up. This means that there are plenty of scab spores available. Our field captures (two-fan trap) are not as high, though we did capture some spores for the first time with the beginning of this rain. We expect that spore release will continue as long as the leaves are wet. We are also seeing large numbers of mature ascospores in squash mounts, though the numbers have declined some over the last two weeks. For all practical purposes petal fall is over in most areas. If you are located in one of the cooler areas that are at petal fall then comments made last week are still appropriate. Take advantage of this thinning opportunity if you still have it. 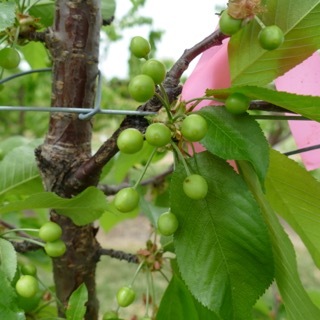 The fruit in the majority of orchards are or soon will be approaching the 6 mm size when it is time to consider your next phase of the thinning program. This is the first opportunity you will have to assess initial set. Fruit that have reached 5 to 6 mm were fertilized and at this point they have the opportunity to develop into fruit that persist to harvest. When fruit are in the 6 to 7 mm range you can also assess the size range of the fruit in each cluster. 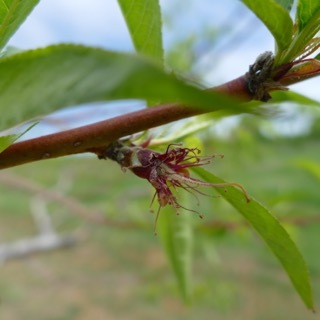 Bloom and petal fall sprays will either prevent pollination or weaken fruit so that they will be more vulnerable to thinners or stressful weather conditions. A range of fruit sizes in the cluster is a good indicator that these smaller fruit can be more easily thinned and less aggressive thinning sprays may be used. At the 7 to 14 mm stage you have available all of the mainstream thinners: NAA, MaxCel, carbaryl and combinations. 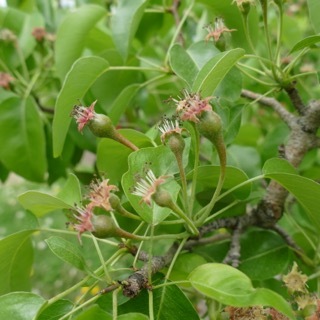 Amid-Thin may be used at this time as well but very early reports (1950s indicate that it is possible for pygmy fruit or small fruit may result on some varieties). Therefore, I have not recommended Amid-Thin use at this time, primarily because of insufficient testing on current varieties. MaxCel is a mild thinner when used alone. When combined with carbaryl it becomes quite a strong thinning combination. If carbaryl was used at petal fall it may make MaxCel applied later a more potent thinner even if it is not present in the same spray tank. MaxCel is best used when temperatures are warm and the forecast for the next 5 days is for moderately cool temperatures. If you plan to use MaxCel it may be best to wait for more favorable temperatures. All fruit growers have had experience with NAA so previous experience with this thinner in your orchard is your best guide. If initial set is heavy then the addition of carbaryl with NAA or MaxCel is appropriate. In last weeks message I encouraged all growers to be somewhat aggressive at petal fall since fruit growth is slow and carbohydrate deficit or excess does not play a dominant role in thinning in the absence of rapid fruit growth. 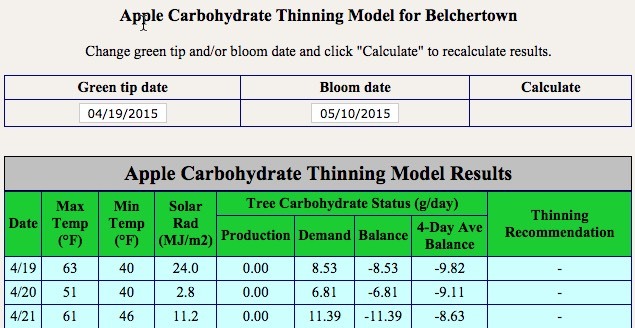 Things have changed this week now that fruit are entering the log (exponential) growth phase where the carbohydrate model should be heeded and used as a guide in making thinning decisions. The weather prediction for Belchertown is for somewhat cool conditions both day and night with partly cloudy to sunny conditions. This normally leads that carbohydrate excess and slightly more difficult thinning. 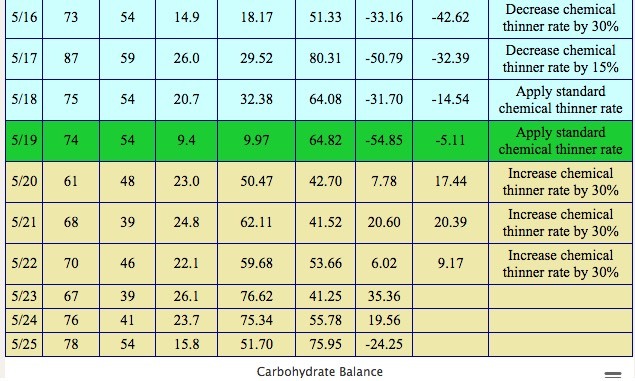 The carbohydrate model for Belchertown (see below) is for excesses of between 15 and 30 which translates into a suggestion for a more aggressive approach to thinning during this period. Even if you do not have access to the NEWA site, weather conditions as just describe cool, sunny to partly cloudy will mean that it will be a little more difficult to thin if applications are made now. Adjust what you put in the spray tank to compensate for the less favorable weather for thinning. Some may be considering trying some form of the fruit growth model to provide direction for thinning in the 7 to 14 mm fruit growth stage. When fruit reach 5 to 6 mm it is time to select the spurs you are going to measure. You may select and tag any number that you wish but 20 to 50 spurs is doable. The more you do the greater the precision. Select these spurs on several trees in locations that reflect the bloom on trees. With an indelible marker number the fruit in each spur 1 to 6 or however many are there. Measure each fruit with a caliper at the location on the fruit where it is numbered and record the size. Come back 3 to 4 days late and place the calipers again on the fruit where numbered, measure fruit size and then record in the spreadsheet. In cool weather wait 4 days to make the second measurement. This fruit growth information can be cut and pasted into the Excel Growth Model located in the UMass website (http://extension.umass.edu/fruitadvisor/resources/clements-corner). This will tell you how many of the fruit you measured are growing at 50% or less of the fastest growing fruit. The next Healthy Fruit will be published on Tuesday, May 26 or thereabouts, 2015. As always feel free to get in touch with any member of the UMass Fruit Team (http://extension.umass.edu/fruitadvisor/team-members) if you have questions or comments.